Training and pruning are essential for growing fruit successfully. Fruit size, quality and pest management are influenced by training and pruning. Untrained and unpruned trees become entangled masses of shoots and branches that produce little or no fruit and harbor insects and diseases. Before training or pruning a plant, visualize the results of the action. Once a branch is pruned out or removed, it cannot be replaced. Train as much as possible and remove as little as possible. Bending and tying shoots instead of cutting them out, especially on apple and pear trees can induce early fruit production. Use sharp pruning tools to make clean cuts. Discard or compost pruned out shoots and branches. These plant parts will serve as dwelling sites for insects and diseases and should be removed from the area to reduce pest populations. Training begins at planting and may be required for several years. Pruning is an annual management practice. Two basic pruning cuts are heading and thinning. Heading or heading back removes the terminal portion of shoots or limbs. Thinning removes an entire shoot or limb to its point of origin on the main branch or lateral. Light pruning can be performed throughout the growing season to remove broken, injured or diseased branches and to improve air circulation to control foliar diseases. Major removal of twigs and branches should be done during the dormant season, preferably before active growth begins in the spring. Training and pruning procedures vary according to the type, age and variety of fruit crop. The types of branching involved in pruning are illustrated below. B. Stubs or broken branches. The day apple trees are planted is the day to begin to train and prune for future production. Too often backyard growers plant apple trees and leave them untended for several years. This neglect results in poor growth and delayed fruiting. Apple trees are trained to a modified leader system. The tree should be trained with one central leader or main trunk in the center, with several wide-angled limbs spaced around the leader. The tree should mature to a pyramidal shape. The picture below shows correct and incorrect pruning of an apple tree. Use “spur-type” strains or grow apples on dwarfing rootstock to make training and pruning easier. 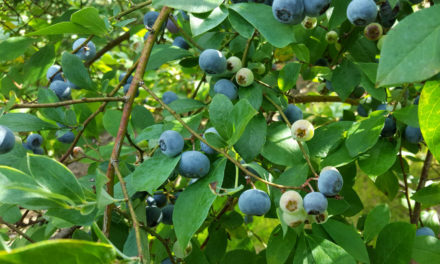 Spur-type and dwarf trees produce fruit at an earlier age than full-sized trees. These trees are also easier to manage and harvest than full-sized trees are. If one-year-old unbranched “whips” are planted, head to the desired height – about 28 to 32 inches for standard and 30 to 35 inches for spur-type and semi-dwarf trees. When the buds grow out to 4 to 5 inches, select a central leader and scaffold branches. Scaffolds (side branches) should be spaced at least 6 inches apart vertically and at equal intervals around the trunk. Between three and six branches may be selected as scaffolds during the first summer or may be left to grow throughout the season and selectively pruned out during the dormant season. If young trees are branched when they come from the nursery or garden center, remove any broken branches and those that form angles less than 45° with the main trunk. Eliminate competing leaders by removing the less desirable branch. Head-back the central leader by one-third in the second year. Make the cut close to a bud that is growing in a suitable direction or to a lateral branch. Keep pruning to a minimum during the early years to encourage the trees to produce fruiting wood. Pear trees naturally develop narrow angled, upright branches. To train properly angled scaffold branches, either weight the branches, tie branches to pegs in the ground or brace the branches apart with spacer sticks. Prune bearing trees to maintain a balance between vegetative growth and fruit production. The first three years should be spent on training only, but by the fourth and fifth years, the trees can be allowed to produce a light crop. Pruning bearing trees is critical to maintain healthy fruiting wood. Remove weak, “shaded-out” wood, diseased or dead wood, watersprouts and root suckers. Control tree height by cutting back the top portion of the tree to weak lateral branches. For flower buds to develop well, all branches of the tree should be exposed to adequate sunlight. This can be a challenge in the lower portion of the tree. On the lowest whorl of secondary scaffolds, merely tip the terminal shoots of these branches rather than cutting them back to laterals. If the fruit quality and yield diminish in older trees, some heavy pruning may be done carefully to restore tree shape and allow more sunlight to penetrate into the tree. Heading-back cuts may stimulate new growth near the cut. If the trees are heavily pruned, reduce the amount of fertilizer applied in relation to the severity of pruning. Heavily pruned trees may not need fertilizer for a year or two. Apple and pear trees grown under favorable conditions will set more fruit than they are capable of carrying to maturity. It is essential to remove excess fruit from the trees to assure satisfactory development of fruit remaining on the tree. 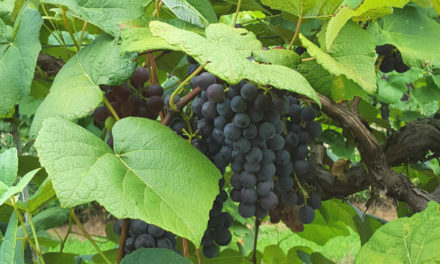 Failure to remove the excess fruit will decrease flower formation for the following year and cause the tree to produce a crop only every other year. Fruit should be removed by hand to one per cluster. Space fruiting clusters about every 6 inches along the limb. To remove the fruit without damaging the spur or other pears on the spur, hold the stem between the thumb and forefinger and push the fruit from the stem with the other fingers. This method will remove the pear leaving the stem attached to the spur. The earlier that hand thinning is completed, the more effective it will be in achieving the desired results. Midsummer thinning will help to improve fruit size, but it will not aid in the formation of next year’s flower buds. Most of the flower buds for next year are initiated during a four to six week period following full bloom, so thin before this time. Many people will purchase a house where an apple tree was planted on the property several years ago. Often, the previous owners did not take the time to properly prune the tree. The tree has become bushy and weak and will produce very poor quality apples. Such a tree requires extensive corrective pruning. The main objective in pruning such a tree is to try and open up the interior to allow good light penetration. The first step is to remove all the upright, vigorous growing shoots at their base that are shading the interior. As with the young apple trees, it is necessary to select 3 to 5 lower scaffold branches with good crotch angles and spaced around the tree. Limbs with poor angles, and excess scaffold limbs, should be removed at their base. In some cases it is advisable to spread the corrective pruning over two to three seasons. When severe pruning is done in the winter, the trees should not be fertilized that spring.